At end-April, the euro was trading at 1,21 dollars. It may seem the euro is excessively overvalued to those who just less than a year ago were firmly betting on parity. 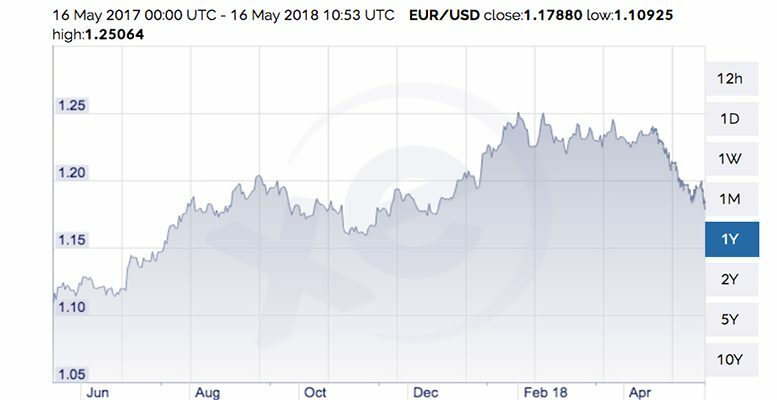 But for those who a couple of months ago, with the exchange rate at 1,25 dollars, were betting on further dollar devaluation, to over levels of 1,30 euros, then the euro will seem undervalued. In some cases, those who just over a year ago were betting on parity, are the same people who a couple of months ago were forecasting an exchange rate of 1,30 dollars/euro. Opinions which are constantly changing, over short periods of time, originate with traders. In this case, currency traders. But looked at with some historic retrospective, the exchange rate of 1,21 dollars/euro seems fairly normal. It’s coming up for 20 years since the euro was born, and its exchange rate has varied between a minimum close to 0,80 dollars and a maximum close to 1,60 dollars, with an average of 1,21 dollars, practically the same as the current exchange rate. The variations in the exchange rate, over short periods of time like quarters, sales performances or results expressed in euros which can lead to simple, erroneous conclusions. This is even more true in the case of a European company with a greater weighting in markets where the dollar is the currency of reference. That is to say in any market outside, if not the Eurozone, then at least Europe. The big European leaders in consumption and industry are in that position because they are also global leaders. In general, although there are relevant differences according to each case, we could say that half of their sales are generated in markets in the Eurozone or with currencies whose exchange rate fluctuates close to the common currency. The other half is generated in markets with the dollar, or with currencies whose exchange rate fluctuates around the dollar. So in quarters where the exchange rate fluctuates significantly compared with the same quarter of the previous year (for example, the first quarter of 2018, when the euro traded on average at levels 10% higher than that in the first quarter of 2017), we can see relatively flat results in euros. That is despite the fact the evolution at a constant exchange rate has been clearly positive, with mid digit growth. For a long-term investor, the big question is to determine in what range of exchange rates the dollar can be expected to fluctuate against the euro. This is in order to work out what might be the standard profit for Eurozone companies which operate in a global market. This range of exchange rates would be what is commonly referred to as PPP (purchasing power parity). Some simplistic approximations (like the Big Mac index, which takes the price of that hamburger in different countries to compare the exchange rate) focus on specific products in the shopping basket to find this parity exchange. Another more serious approximation would come from analysing at what exchange rates two companies, one European and one from the US, with the same business, equally efficient, operate in the same markets, obtain similar operating margins and are equally competitive. This would be the parity exchange rate, which would not favour one or the other side of the Atlantic, the supremacy in a global market. In Europe, there are two companies which give explicit details in their Annual Reports about their long-term exchange rates’ coverage strategy. These are Airbus and Safran, world leaders in the market for commercial planes and aviation engines. They have to compete with their US peers like Boeing or Pratt&Whitney in a global market which establishes the prices of its goods in dollars (while a good part of the European firms’ costs are in euros). Airbus and Safran have order books equivalent to over eight years of their current annual output, while their investment plans and sales budgets have to be made with a perspective of several decades. So Safran is currently guaranteeing, in the long-term, for the next decade, an exchange rate of 1,18 dollars/euro,while Airbus’ is 1,26 dollars/euro. They are not the same, but neither are they so far apart. If we take the average point of both strategies (1,22 dollars/euro), the exchange rate is practically the one which claims to allow our aeroplane manufacturers and their US peers to be equally competitive in the long-term. Quite similar to the current exchange rate and the historic average. Thus the current dollar/euro exchange rate seems very close to the parity marked by the PPP. It’s also near the euro’s original exchange rate (1,16 dollars/euro), adjusted depending on the inflation differential between the US and the Eurozone.